Connor Baxter has shown yet again why he’s almost permanently ranked number one in the world, pulling clear in the closing stages of today’s windy, unpredictable and exciting distance race here at the Mercedes-Benz ‘SUP World Cup’ in Scharbeutz, Germany to narrowly claim the overall event title ahead of Lincoln Dews and Arthur Arutkin. After battling through five laps of the bumpy course, where the howling offshore wind produced everything from downwind to sidewind to headwind conditions that splintered the field early and produced big time gaps on the results sheet, Connor somehow found another gear in the final few hundred metres to win by about four board lengths. The race looked set to be a battle of 7 after Connor, Casper, Arthur, James Casey, Michael Booth, Trevor Tunnington and Bruno Hasulyo broke clear on the opening lap. But after a heroic effort from Marcus Hansen, who single-handedly closed the gap on the leaders and dragged Casper Steinfath and Martino Rogai back up with him, the final lap became a 10-man battle royale. Making the most of his second chance was Casper, who was determined to avenge an early exit in his pet event, the knockout sprints, on Saturday afternoon. The Danish Viking saved his best for last in this afternoon’s 10km race: After getting a ride back to the front with Marcus (whom he probably owes a beer or two), Casper worked his way up through the lead group over the final kilometre and engaged Arthur, Lincoln, Jimmy and Boothy in an intense, all-out sprint to the beach where he snuck through to claim the runner-up spot. After leading the race at certain stages, particularly on the downwind legs, Arthur had to settle for third, but that was more than enough to secure a spot on the overall podium. The young Frenchman was clearly one of the in-form paddlers this weekend, and he should carry a lot of confidence from this weekend’s result as he looks ahead to the ISA Worlds in Denmark in two months’ time. Lincoln was another early race leader but was squeezed out of the distance race podium in the final, frantic few seconds of the race. 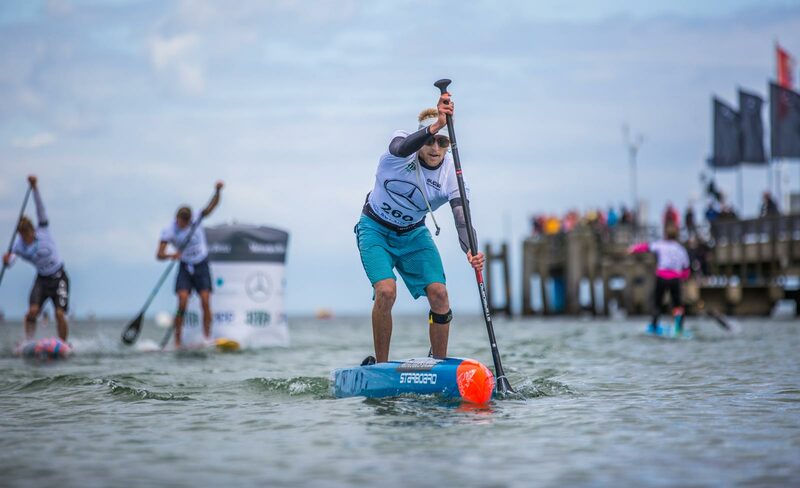 After winning yesterday’s sprints and helping set the pace for much of today’s contest, Lincoln looked on target to claim the overall SUP World Cup title, but give Connor Baxter an inch and he’ll take a mile. So on the overall leaderboard it’s Connor on 4 points vs Lincoln and Arthur on 5. Linc gets the nod over Arthur on the countback (highest individual result), which means the overall podium is Connor 1st, Lincoln 2nd, Arthur 3rd. James Casey takes 4th on the overall podium after finishing 5th today, a mirror image of his result in yesterday’s sprints. James, or Jimmy as he’s known, also helped set the pace in a race that had countless lead changes that enthralled the large crowd assembled on the beach and along the perfectly-positioned pier. The heartbreaker result today came from Michael Booth, who forgot to take off his legrope (leash) as he jumped off his board for the run up the beach, which sent him from a potential 2nd or 3rd place finish straight back into 6th. It hasn’t been Boothy’s weekend here at the SUP World Cup, with a quarter-final exit in the sprints. 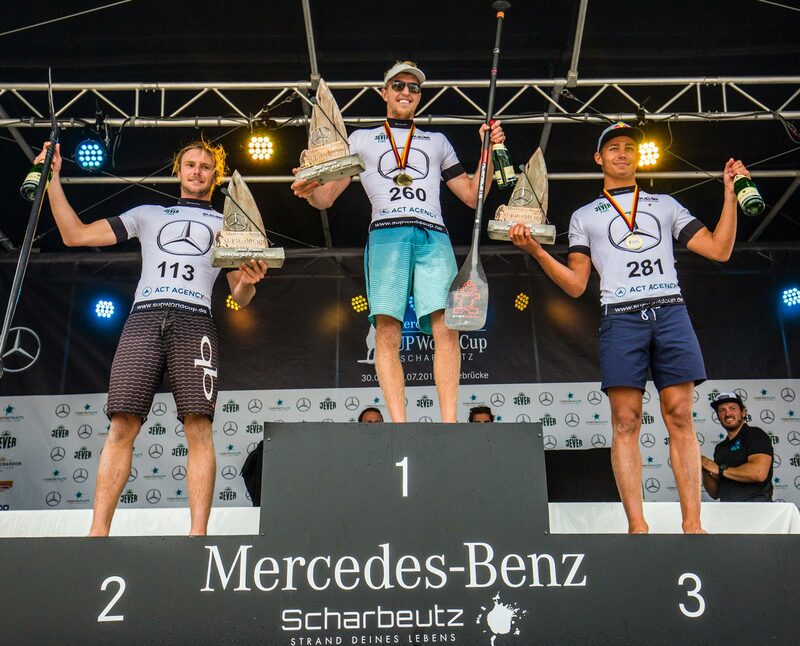 However the Aussie powerhouse did make up for it in the separate EuroTour SUP World Cup race this morning, where he outlasted Leo Nika and Mo Freitas to take week 9 of the Tour and put an exclamation mark on the overall EuroTour title that he wrapped up back in San Sebastian. Trevor Tunnington was consistently strong but faded slightly in the closing stages of each race, finishing 7th today, which, along with his 8th place in the sprints, gave him 7th overall. Finishing 8th today was Marcus, a result that doesn’t highlight just how impressively the New Zealander worked to close the gap on the leaders in the second half of the race. After a rollercoaster summer that has included some disappointing results, Marcus can take a lot of pride in his performance today. Bruno Hasulyo was with the leaders all afternoon but couldn’t keep pace in the final push to the finish, settling for 9th, while Italy’s Martino Rogai rounded out the top 10 before there was a large gap back to the chase group that included many of his Italian compatriats such as Paolo Marconi and Federico Esposito; the ‘Italian Mafia’ has been rolling deep on the European Summer of SUP and this weekend was no exception (Federico and Paolo finished 4th/5th in this morning’s EuroTour race). The women’s 10K race was as much of an exciting rollercoaster as the men’s, with a small but very strong field endlessly switching up the lead around the wind-swept course. Yesterday’s sprint runner-up Manca Notar was an early leader, as was Saturday’s champion Fiona Wylde. But the young guns were quickly joined by Olivia Piana, Sonni Honscheid, Angie Jackson, Terrene Black, Susak Molinero and the supremely under-rated Yuka Sato from Japan in a group of 7. 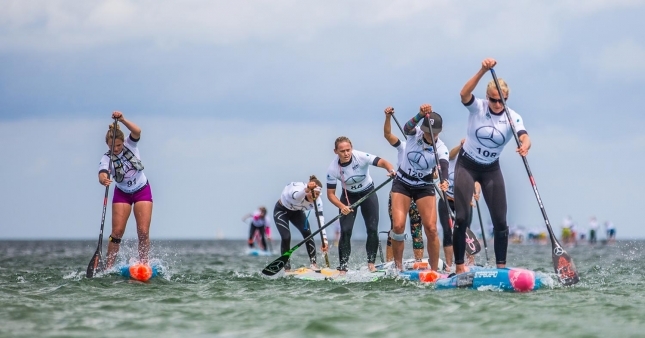 That group would stay together for the next couple of laps, with Sonni, Fiona and Olivia all taking the lead at various points as the field battled through an intense headwind that made competitors look like they were paddling in slow motion. The big surprise came on the third lap when overall title contender Manca Notar, who had suddenly been dropped by and lost a lot of ground on the lead pack, retired from the race. Manca’s exit left the top half dozen to battle it out for the win. As the wind continued to strengthen and the paddlers began to tire, the front group began to splinter over the next two laps. Angie and Yuka were dropped but then regained touch, before Sonni seemingly hit the wall and went from 1st to 5th in the space of half a lap. By the time the elite women hit the final loop around the course, the lead duo of Olivia Piana and Fiona Wylde seemed to be in control of proceedings. It would stay like that all the way to the finish, as the Starboard team mates hammered out their last ounces of energy in a spirited sprint to the line. Olivia, who has been incredibly impressive in Europe this summer and now carries a solid winning streak in distance races, held on to defeat the young American, pulling away in the final metres to win by about 10 seconds. Even more impressive is the fact this was Olivia’s second distance race of the day: she also won the EuroTour race this morning. 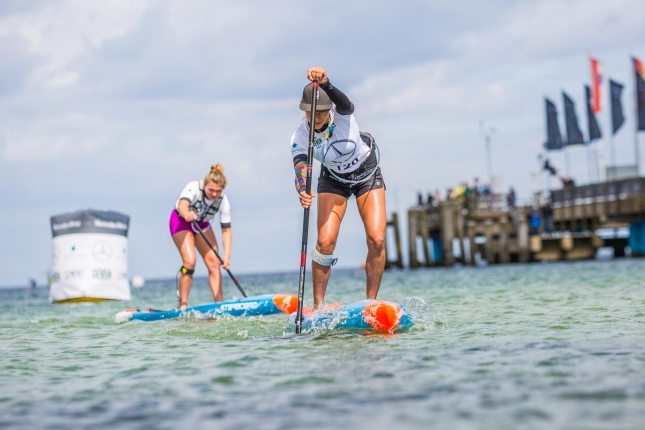 Fiona comfortably held on for the runner-up spot, which secured her the overall SUP World Cup title after yesterday’s sprints were added into the mix. Yuka came home third today to convincingly prove that she’ll be a threat in future races, while Angie matched her 4th place in the sprints to move up onto the overall podium. 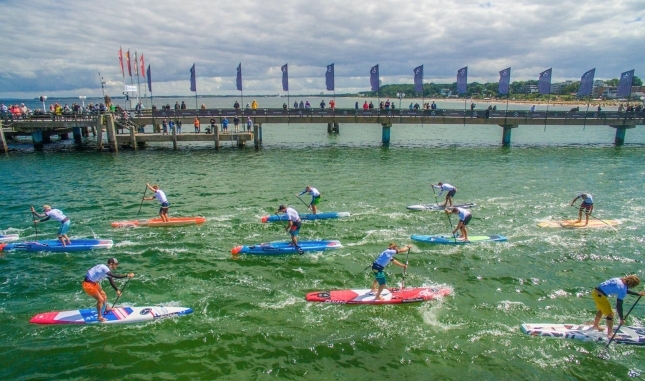 Terrene Black narrowly edged out Spain’s Susak Molinero to cross in 6th. Though considering her (and Angie’s) board failed to be delivered to Germany from Japan, Terrene almost didn’t get to compete at all this weekend. 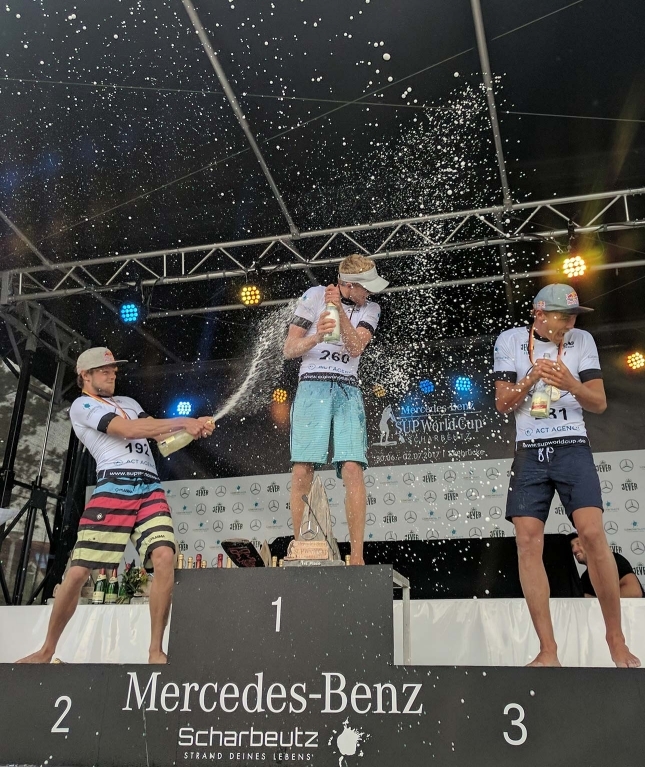 The day finished with the SUP World Cup’s signature champagne shower on the podium, a memorable way to cap off an event that will certainly be a talking point of the season. 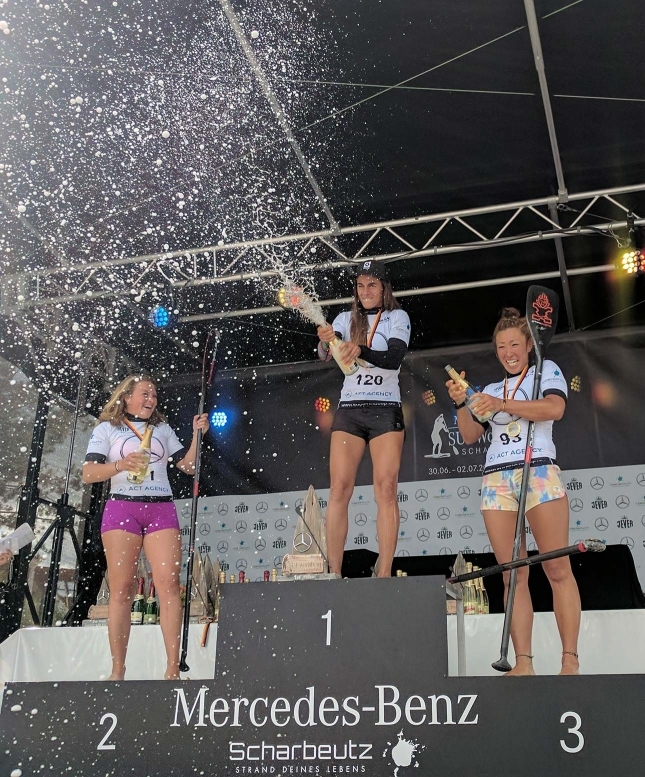 A big thank you to the organisers from the ACT Agency for pulling off another world class event here in Germany, and to Mercedes-Benz for backing the race and making it all possible. We’ll have full results and video highlights from Scharbeutz on Monday morning, but in the meantime here are the top finishers plus a replay of our last-minute live stream (thank you to everyone that tuned in). 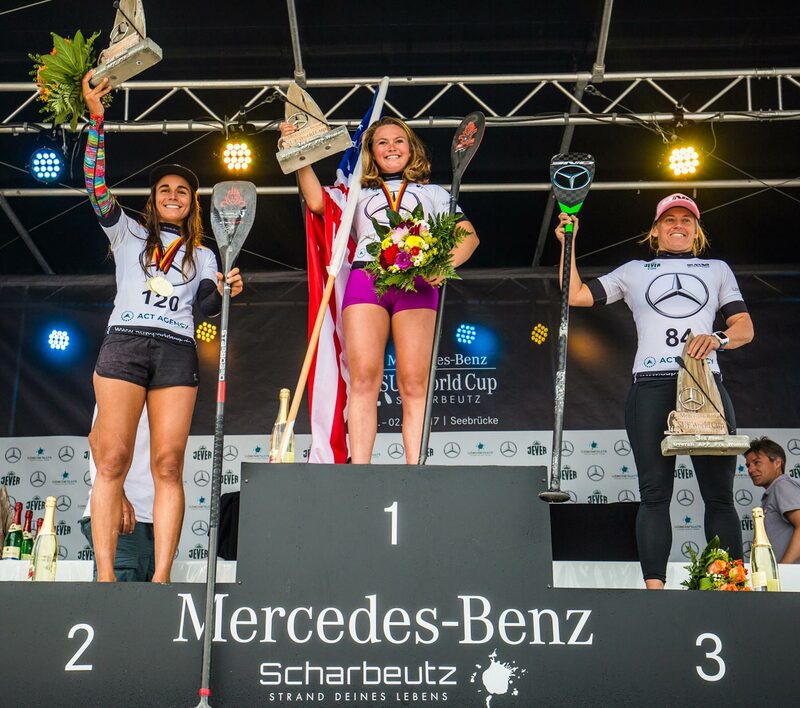 Take a look at our SUP World Cup Saturday recap to see how things went down in the knockout sprint race.